HOW A BIOLOGIST MIGHT TRACE POSSIBLE EVOLUTIONARY RELATIONSHIPS AMONG PRESENT AND PAST LIFE FORMS Please Note: (1) This title and objective, does not say. 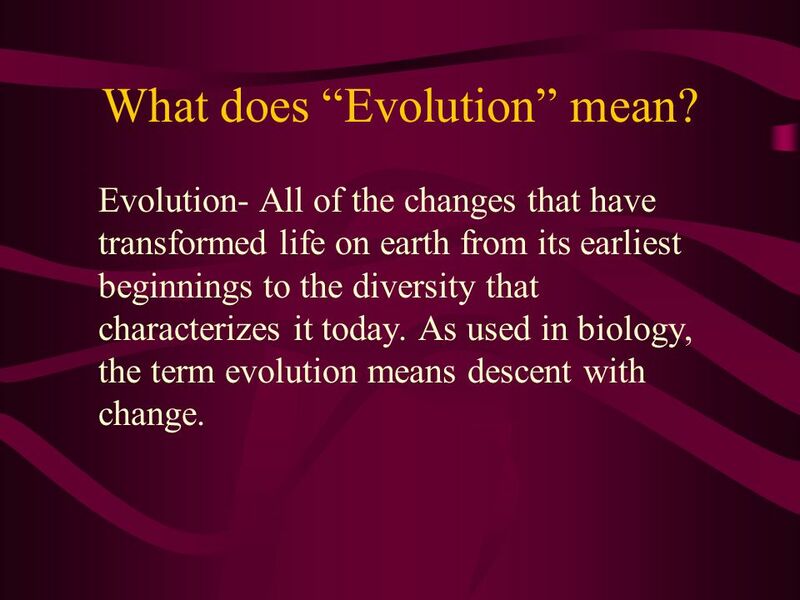 2 What does “Evolution” mean? Evolution- All of the changes that have transformed life on earth from its earliest beginnings to the diversity that characterizes it today. As used in biology, the term evolution means descent with change. 3 What does “Evolution” mean? Briefly, the theory of organic evolution holds that all organisms are related by common ancestry to one or a very few original cells. By a number of processes, including random variation followed by natural selection of successful variants, new forms arose and the number of species increased over an immense period of time. 4 What does “Evolution” mean? Evolution is the concept that the universe has had a history: what we see today -- stars, galaxies, the planet Earth, and earthly life forms -- is different from what existed in the past. 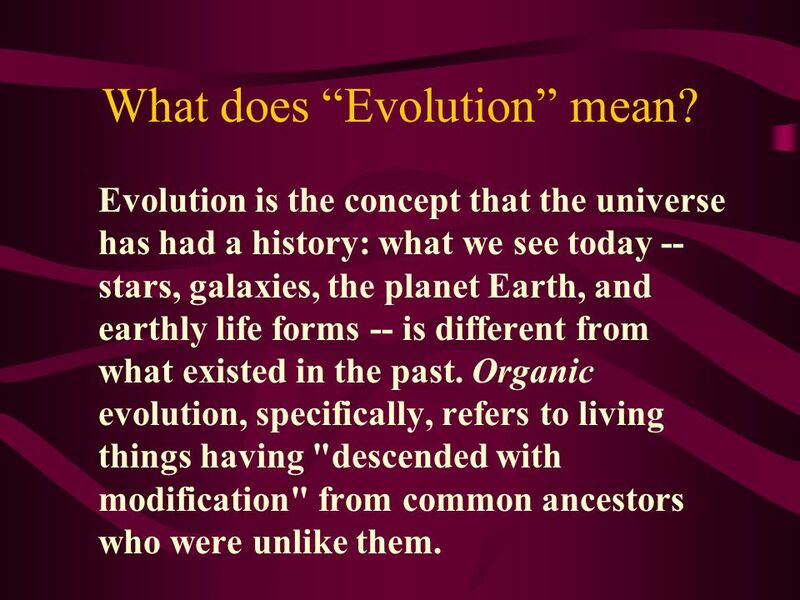 Organic evolution, specifically, refers to living things having "descended with modification" from common ancestors who were unlike them. 5 What does “Evolution” mean? 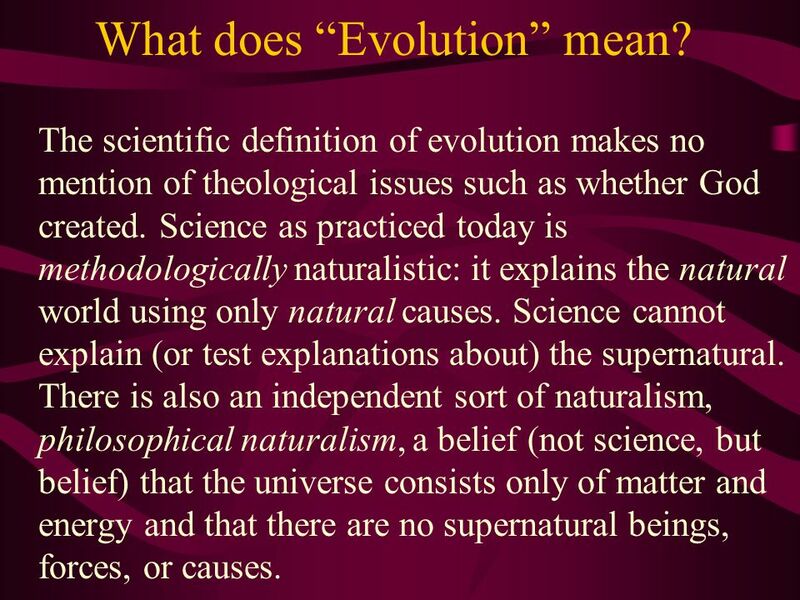 The scientific definition of evolution makes no mention of theological issues such as whether God created. Science as practiced today is methodologically naturalistic: it explains the natural world using only natural causes. Science cannot explain (or test explanations about) the supernatural. There is also an independent sort of naturalism, philosophical naturalism, a belief (not science, but belief) that the universe consists only of matter and energy and that there are no supernatural beings, forces, or causes. 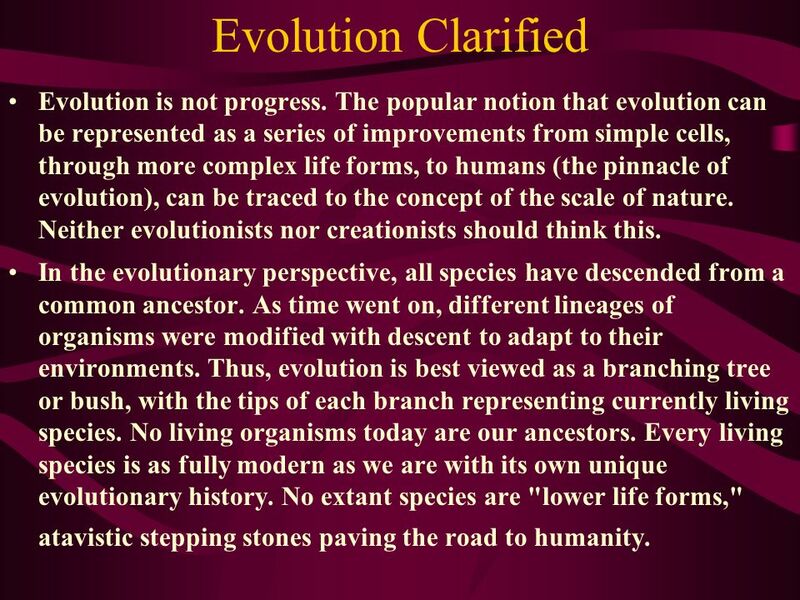 6 Evolution Clarified Evolution is not progress. The popular notion that evolution can be represented as a series of improvements from simple cells, through more complex life forms, to humans (the pinnacle of evolution), can be traced to the concept of the scale of nature. Neither evolutionists nor creationists should think this. In the evolutionary perspective, all species have descended from a common ancestor. As time went on, different lineages of organisms were modified with descent to adapt to their environments. Thus, evolution is best viewed as a branching tree or bush, with the tips of each branch representing currently living species. No living organisms today are our ancestors. Every living species is as fully modern as we are with its own unique evolutionary history. No extant species are "lower life forms," atavistic stepping stones paving the road to humanity. 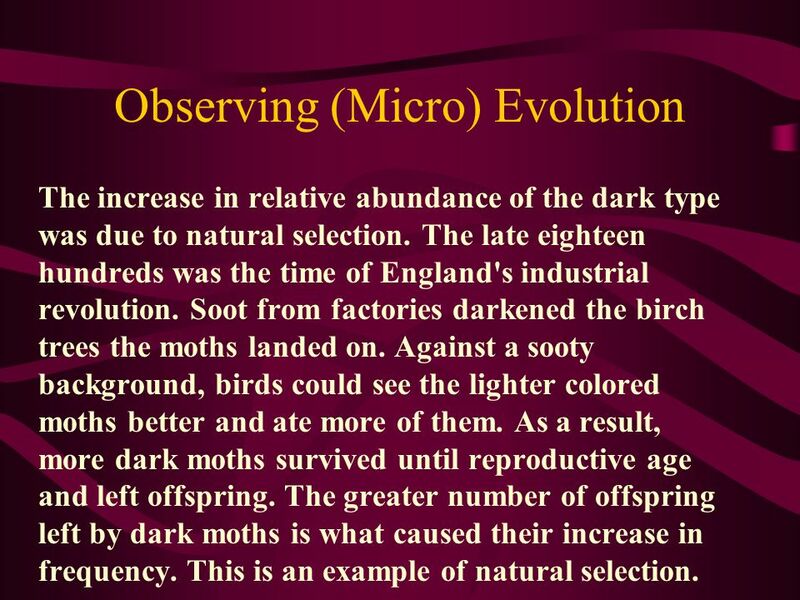 7 Natural Selection Some types of organisms within a population leave more offspring than others. Over time, the frequency of the more prolific type will increase. The difference in reproductive capability is called natural selection. 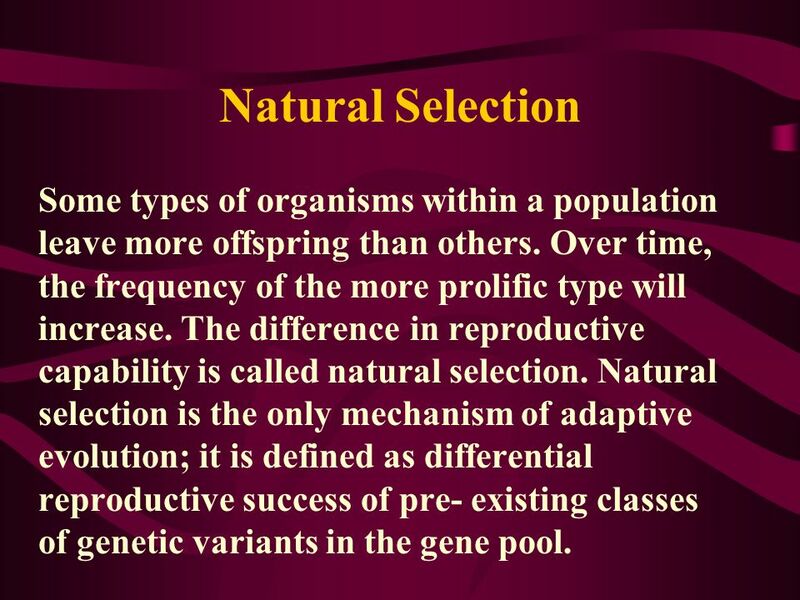 Natural selection is the only mechanism of adaptive evolution; it is defined as differential reproductive success of pre- existing classes of genetic variants in the gene pool. 8 MUTATIONS The cellular machinery that copies DNA sometimes makes mistakes. These mistakes alter the sequence of a gene. This is called a mutation. Typical rates of mutation are between and mutations per base pair of DNA per generation. Most mutations that have any effect are deleterious. Mutations that result in amino acid substitutions can change the shape of a protein, potentially changing its function. Organisms are sufficiently complicated that most random changes will not produce a fitness benefit. Only a very small percentage of mutations are beneficial. The ratio of neutral to deleterious to beneficial mutations is unknown and probably varies with respect to what is mutating and the environment. 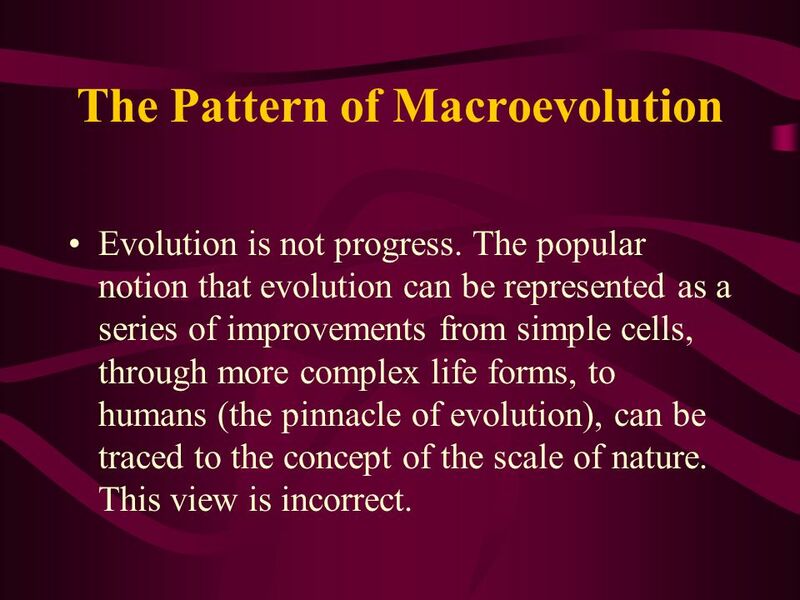 Macroevolution- Evolutionary change on a grand scale, encompassing the origin of novel designs, evolutionary trends, adaptive radiation, and mass extinction. 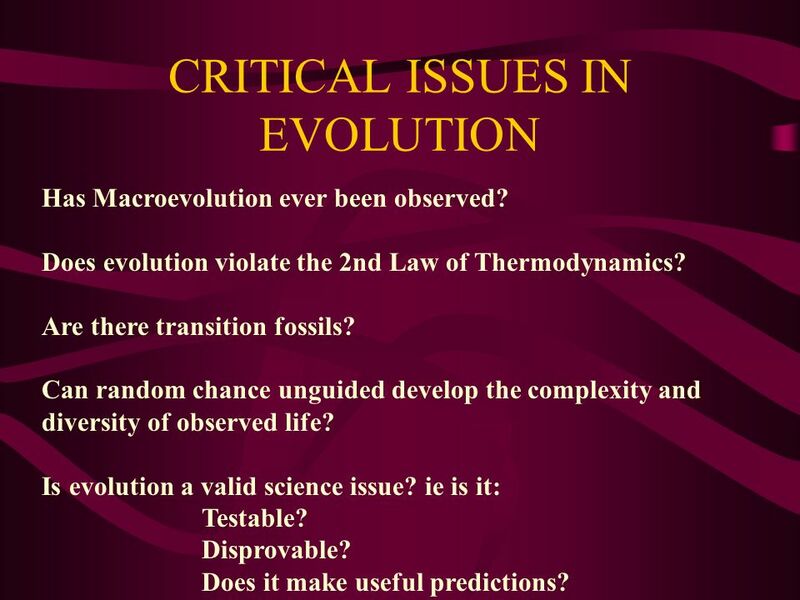 Macroevolution is not observable directly, since long periods of time are required for it to occur. 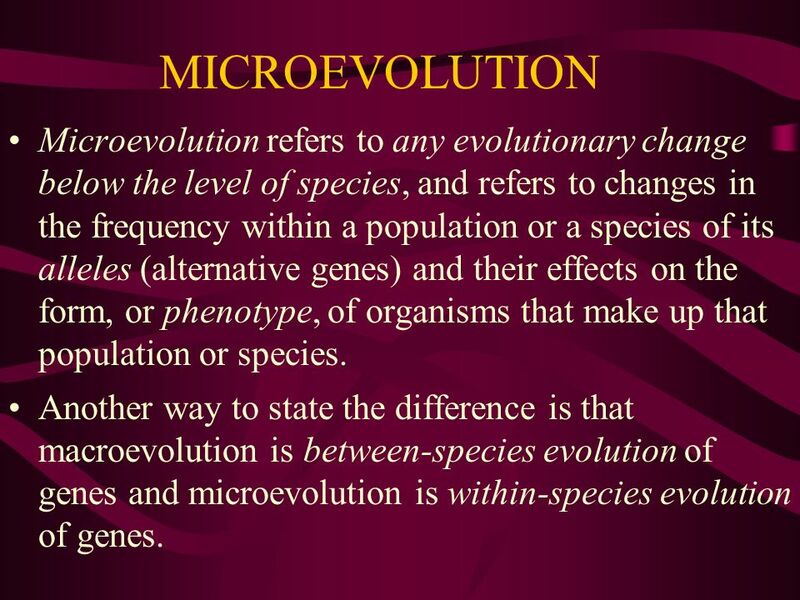 Microevolution- A change in the gene pool of a population over a succession of generations. This is clearly observable and is not controversial. The species is not necessarily changed. 10 MICROEVOLUTION Microevolution refers to any evolutionary change below the level of species, and refers to changes in the frequency within a population or a species of its alleles (alternative genes) and their effects on the form, or phenotype, of organisms that make up that population or species. Another way to state the difference is that macroevolution is between-species evolution of genes and microevolution is within-species evolution of genes. Microevolution is a change in the gene pool of a population over time. A gene is a hereditary unit that can be passed on unaltered for many generations. The gene pool is the set of all genes in a species or population. The English moth, Biston betularia, is a frequently cited example of observed evolution. In this moth there are two color morphs, light and dark. 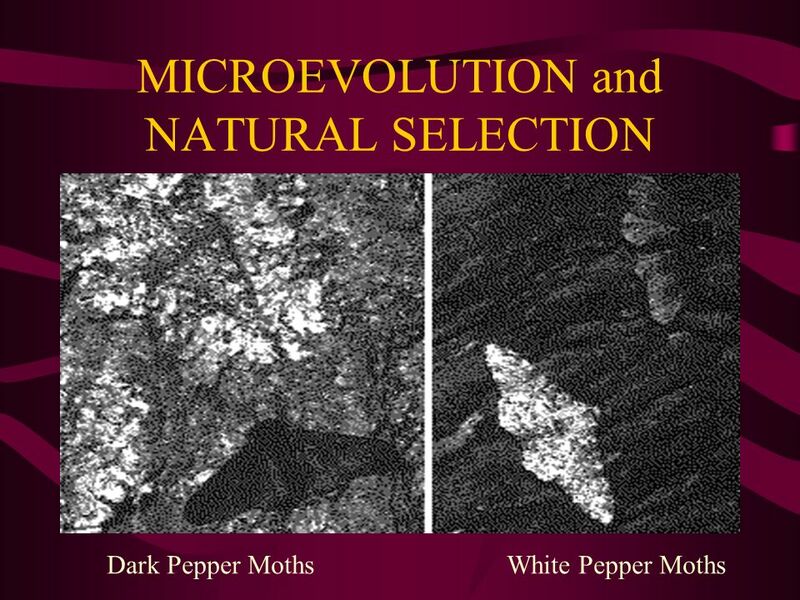 Dark moths constituted less than 2% of the population prior to The frequency of the dark morph increased in the years following. By 1898, the 95% of the moths in Manchester and other highly industrialized areas were of the dark type. Their frequency was less in rural areas. The moth population changed from mostly light colored moths to mostly dark colored moths. The moths' color was primarily determined by a single gene. 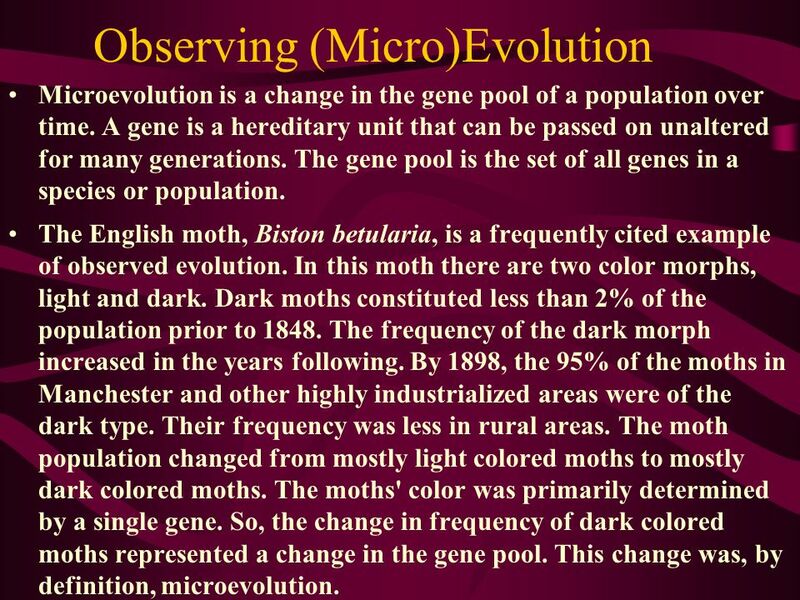 So, the change in frequency of dark colored moths represented a change in the gene pool. 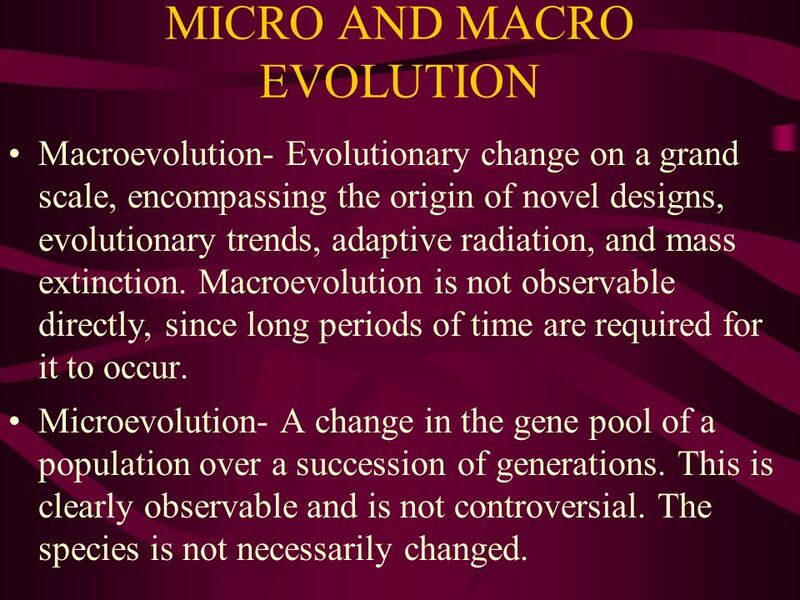 This change was, by definition, microevolution. 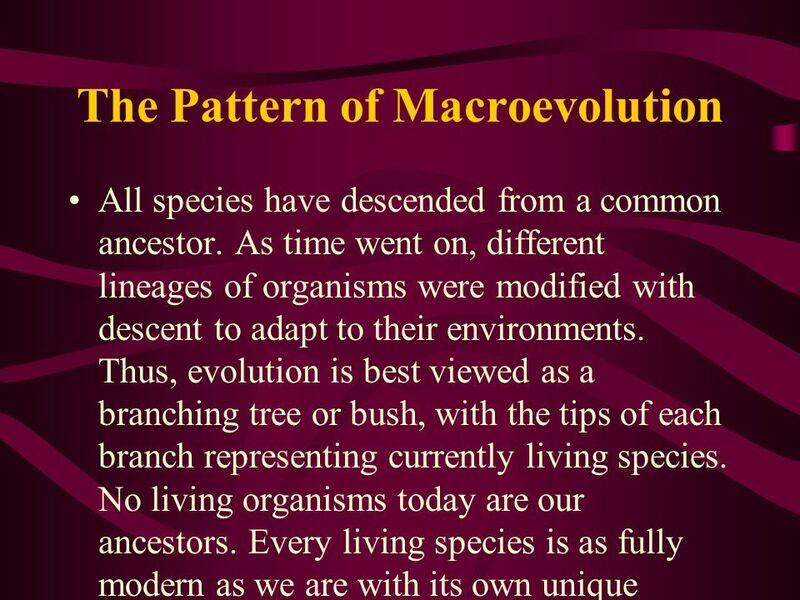 14 MACROEVOLUTION In evolutionary biology today, macroevolution is used to refer to any evolutionary change at or above the level of species. It means the splitting of a species into two (speciation, or cladogenesis, from the Greek meaning "the origin of a branch") or the change of a species over time into another (anagenesis, not nowadays generally used). 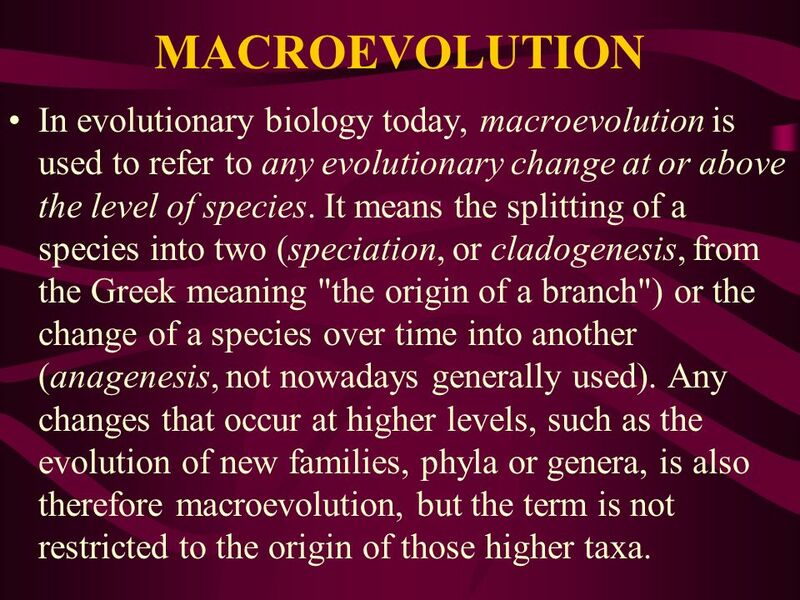 Any changes that occur at higher levels, such as the evolution of new families, phyla or genera, is also therefore macroevolution, but the term is not restricted to the origin of those higher taxa. Evolution is not progress. The popular notion that evolution can be represented as a series of improvements from simple cells, through more complex life forms, to humans (the pinnacle of evolution), can be traced to the concept of the scale of nature. This view is incorrect. All species have descended from a common ancestor. As time went on, different lineages of organisms were modified with descent to adapt to their environments. Thus, evolution is best viewed as a branching tree or bush, with the tips of each branch representing currently living species. No living organisms today are our ancestors. Every living species is as fully modern as we are with its own unique evolutionary history. No extant species are "lower life forms," atavistic stepping stones paving the road to humanity. A related, and common, fallacy about evolution is that humans evolved from some living species of ape. This is not the case -- humans and apes share a common ancestor. Both humans and living apes are fully modern species; the ancestor we evolved from was an ape, but it is now extinct and was not the same as present day apes (or humans for that matter). If it were not for the vanity of human beings, we would be classified as an ape. Our closest relatives are, collectively, the chimpanzee and the pygmy chimp. Our next nearest relative is the gorilla. 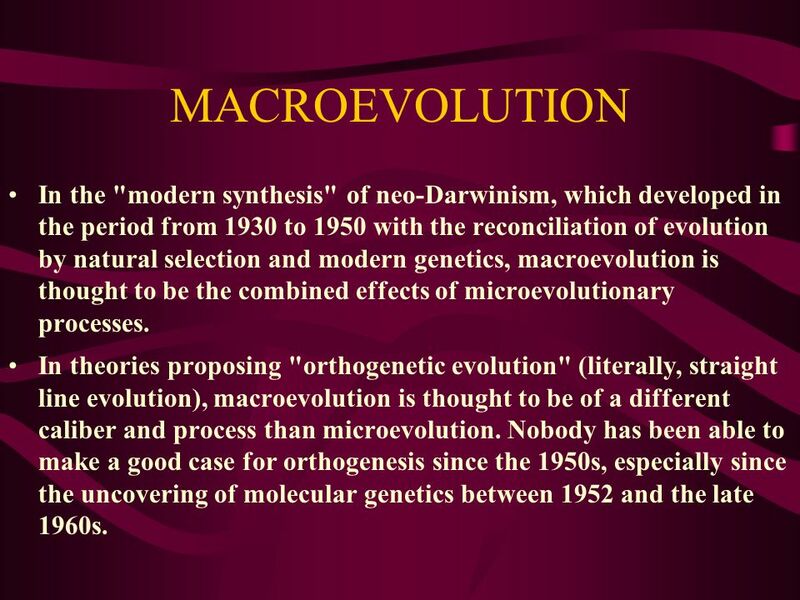 18 MACROEVOLUTION In the "modern synthesis" of neo-Darwinism, which developed in the period from 1930 to 1950 with the reconciliation of evolution by natural selection and modern genetics, macroevolution is thought to be the combined effects of microevolutionary processes. 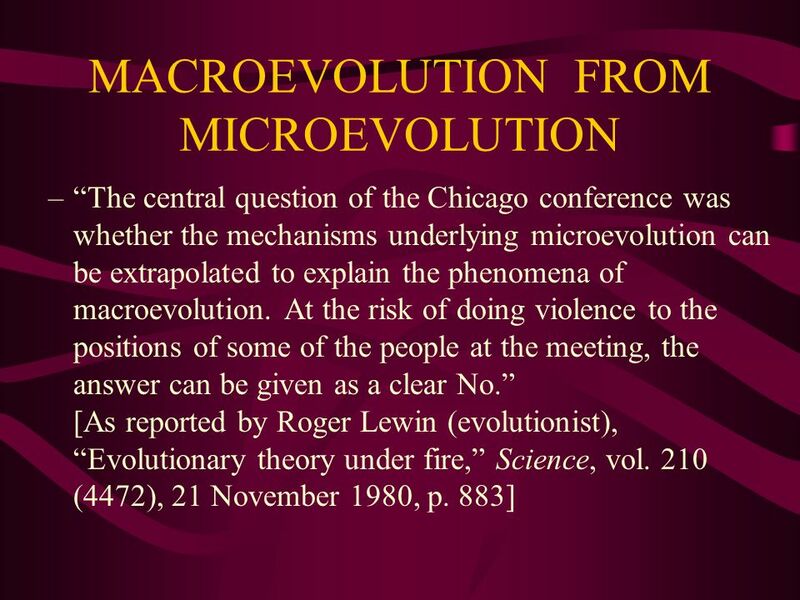 In theories proposing "orthogenetic evolution" (literally, straight line evolution), macroevolution is thought to be of a different caliber and process than microevolution. 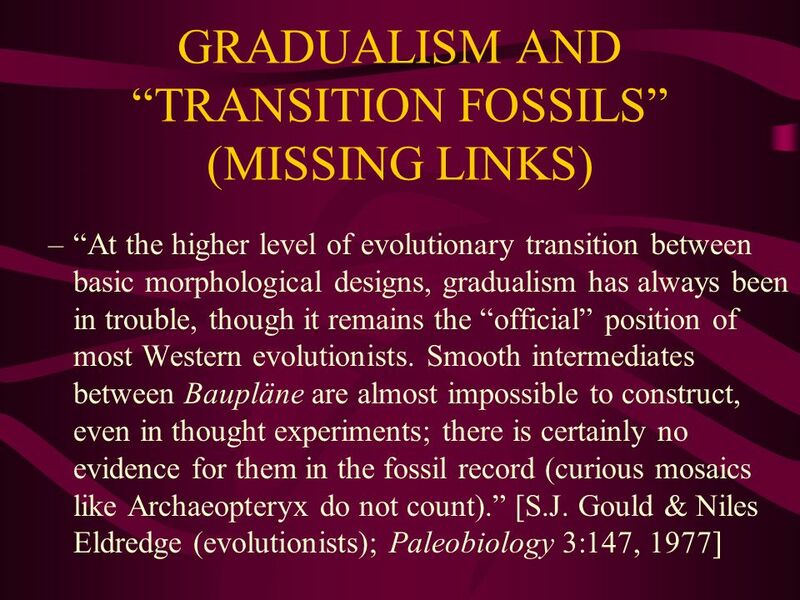 Nobody has been able to make a good case for orthogenesis since the 1950s, especially since the uncovering of molecular genetics between 1952 and the late s.
19 MACROEVOLUTION Antievolutionists argue that there has been no proof of macroevolutionary processes. 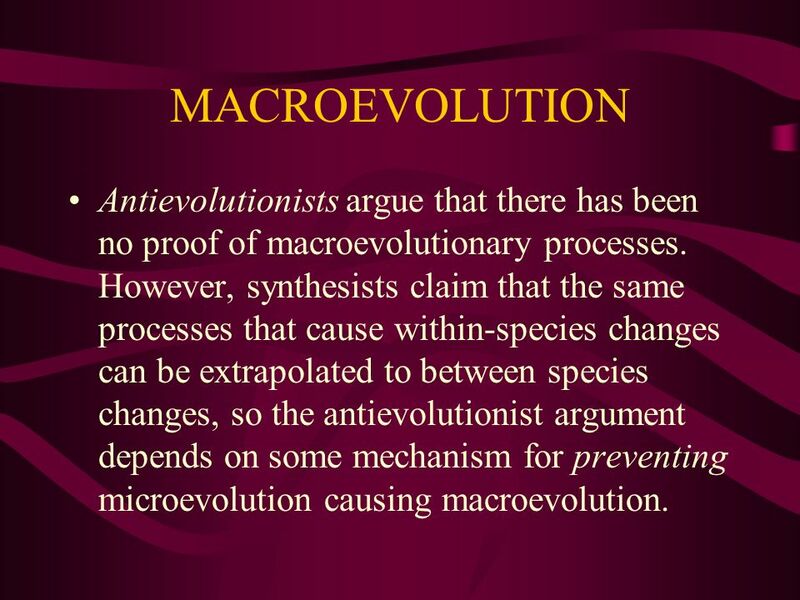 However, synthesists claim that the same processes that cause within-species changes can be extrapolated to between species changes, so the antievolutionist argument depends on some mechanism for preventing microevolution causing macroevolution. 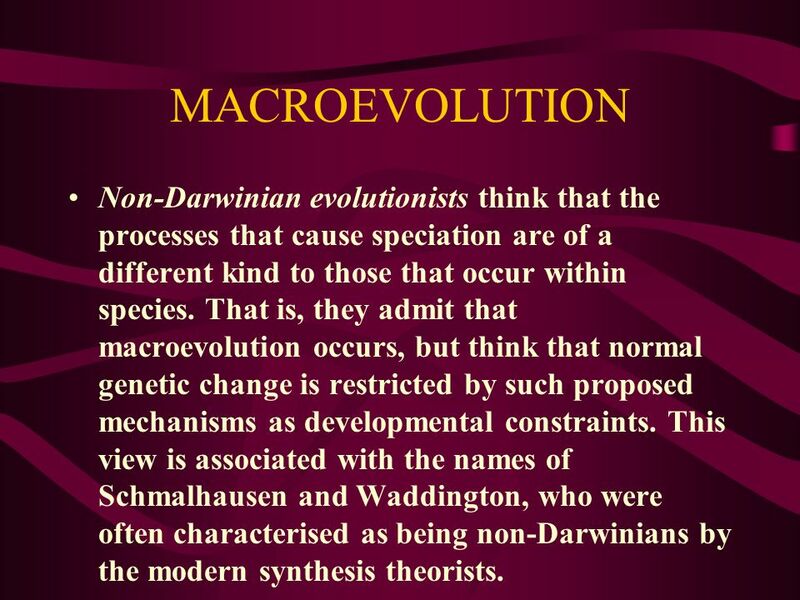 20 MACROEVOLUTION Non-Darwinian evolutionists think that the processes that cause speciation are of a different kind to those that occur within species. That is, they admit that macroevolution occurs, but think that normal genetic change is restricted by such proposed mechanisms as developmental constraints. This view is associated with the names of Schmalhausen and Waddington, who were often characterised as being non-Darwinians by the modern synthesis theorists. 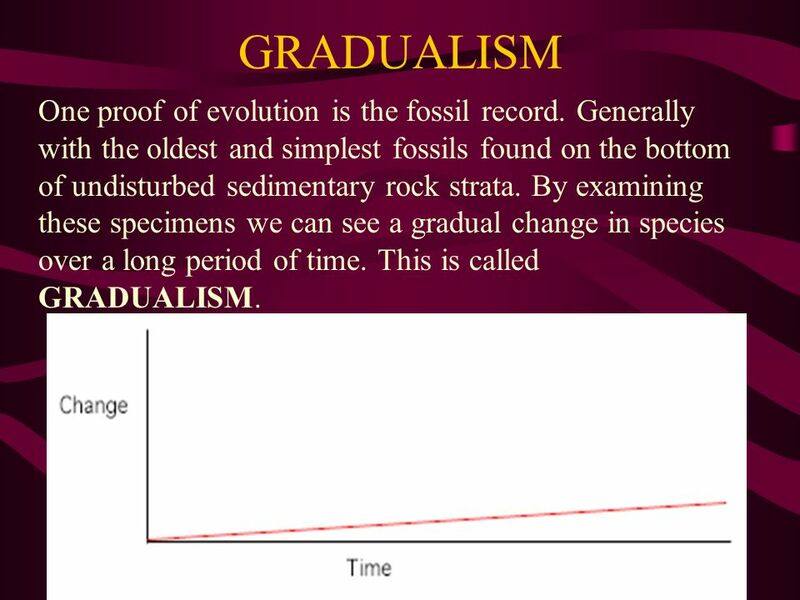 22 GRADUALISM One proof of evolution is the fossil record. Generally with the oldest and simplest fossils found on the bottom of undisturbed sedimentary rock strata. By examining these specimens we can see a gradual change in species over a long period of time. This is called GRADUALISM. Sometimes species will remain the same for a long period of time and then change very quickly. This is usuallly the result of some catastrophic dissaster like an earthquake or volcano. 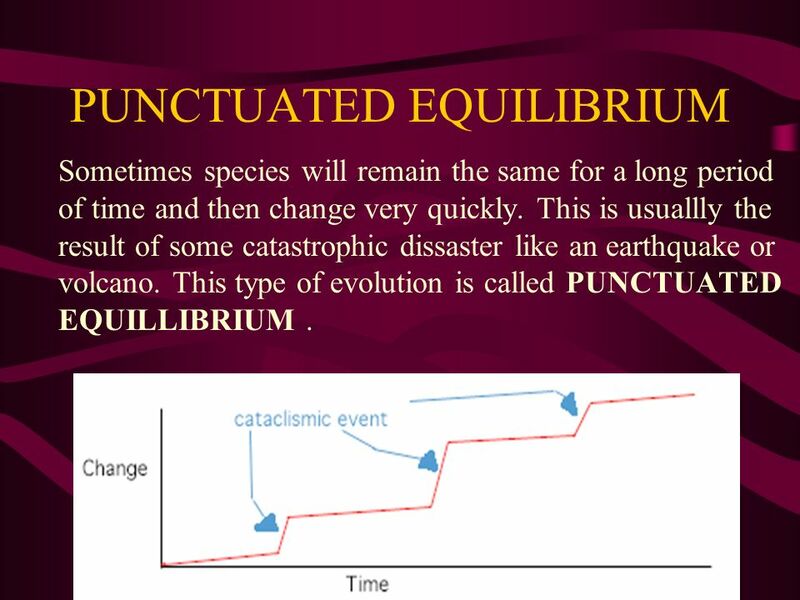 This type of evolution is called PUNCTUATED EQUILLIBRIUM . Microevolution can be studied directly. Macroevolution cannot. 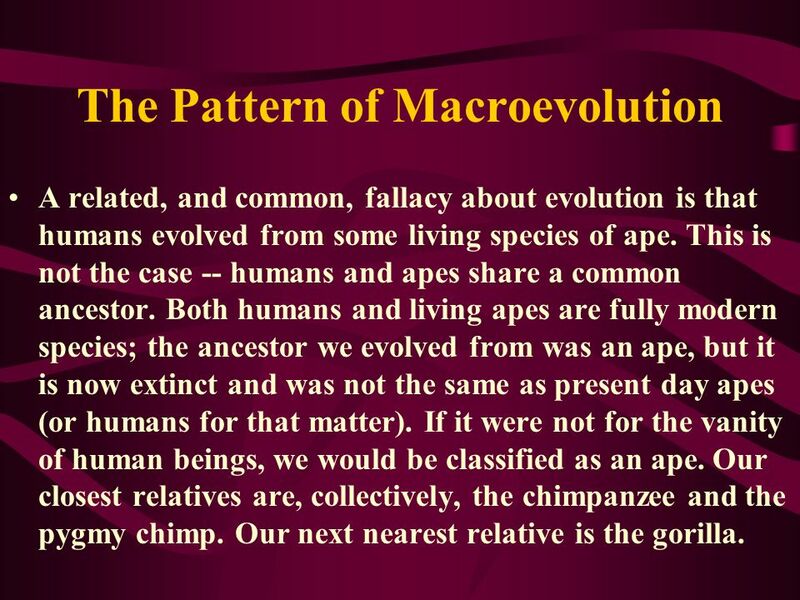 Macroevolution is studied by examining patterns in biological populations and groups of related organisms and inferring process from pattern. Given the observation of microevolution and the knowledge that the earth is billions of years old -- macroevolution could be postulated. But this extrapolation, in and of itself, does not provide a compelling explanation of the patterns of biological diversity we see today. Evidence for macroevolution, or common ancestry and modification with descent, comes from several other fields of study. These include: comparative biochemical and genetic studies, comparative developmental biology, patterns of biogeography, comparative morphology and anatomy and the fossil record. 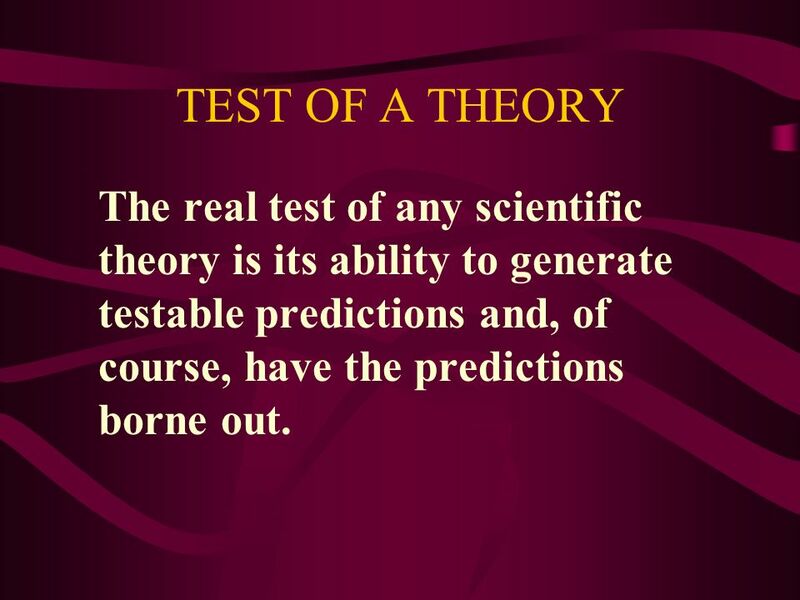 26 TEST OF A THEORY The real test of any scientific theory is its ability to generate testable predictions and, of course, have the predictions borne out. 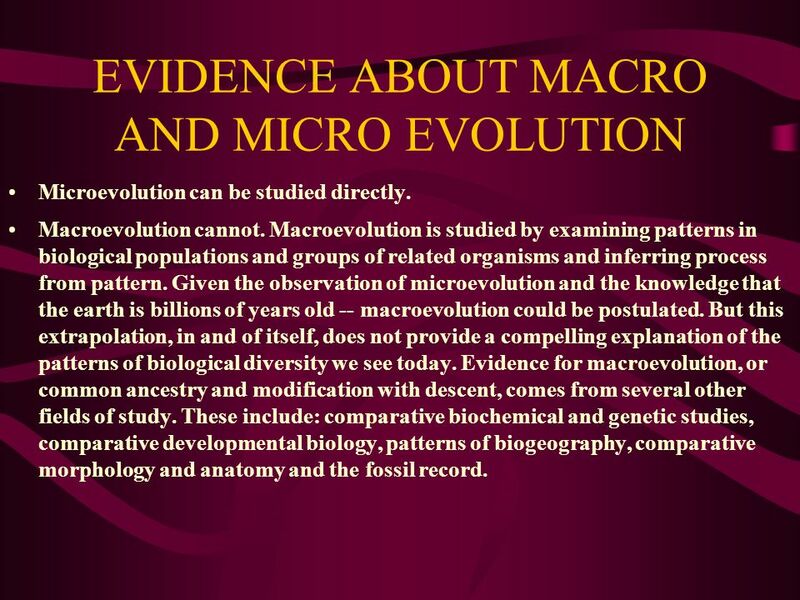 Has Macroevolution ever been observed? Does evolution violate the 2nd Law of Thermodynamics? Are there transition fossils? Can random chance unguided develop the complexity and diversity of observed life? Is evolution a valid science issue? ie is it: Testable? Disprovable? Does it make useful predictions? 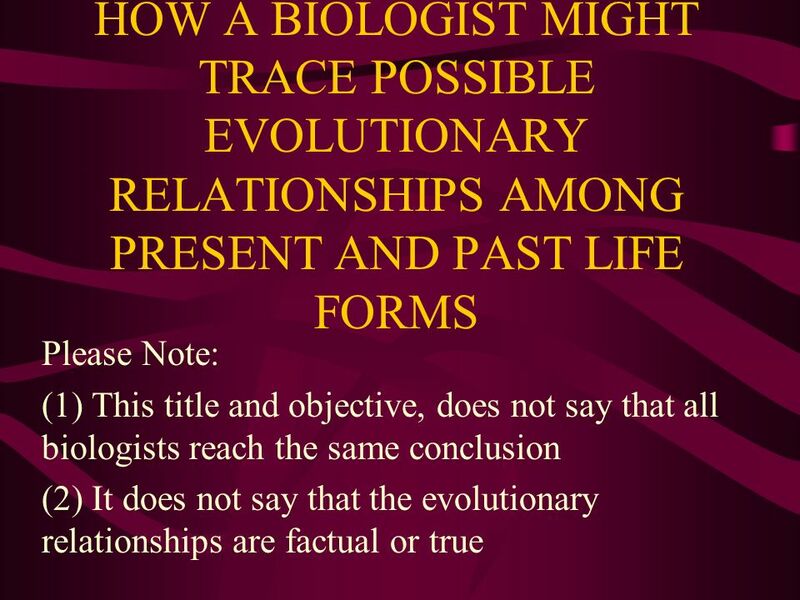 Download ppt "HOW A BIOLOGIST MIGHT TRACE POSSIBLE EVOLUTIONARY RELATIONSHIPS AMONG PRESENT AND PAST LIFE FORMS Please Note: (1) This title and objective, does not say." Chapter 17 Evidence of Evolution AP Biology Spring 2011. Charles Darwin & The Theory of Evolution. Warm-up 1) What is the central dogma? 2) Put the following steps of protein synthesis in order. ___ Polypeptides (proteins) are formed as ribosomes move. Evidence of Evolution. Voyage of the Beagle Charles Darwin’s observations on a voyage around the world led to new ideas about species.  1) Natural Selection  Meiosis (sexual reproduction) and mutations gives us genetic variation. 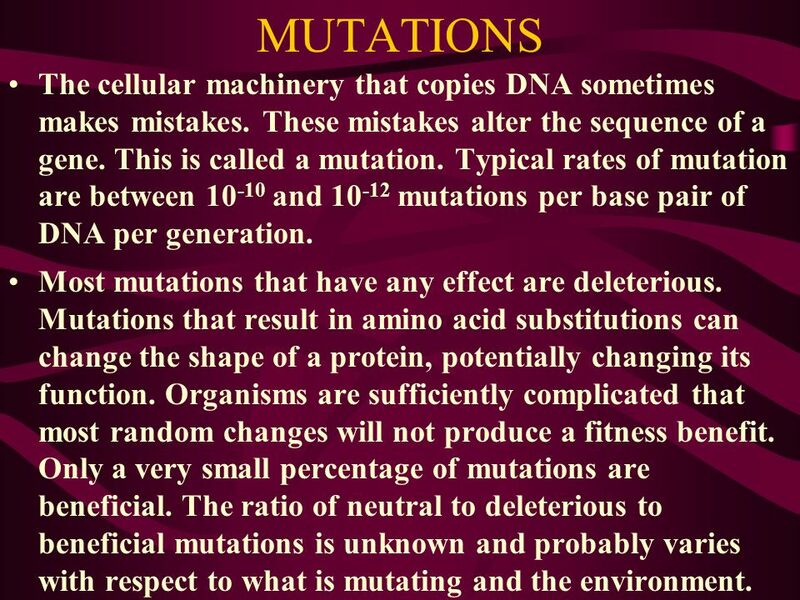  MUTATION: a change in a gene  If the population’s gene. EVOLUTION: A History and a Process. Voyage of the Beagle  During his travels, Darwin made numerous observations and collected evidence that led him to. Evidence of Evolution. Voyage of the Beagle  Charles Darwin’s observations on a voyage around the world led to new ideas about species. The Evidence for Evolution. Problem: How did the great diversity of life originate? Alternative Solutions: A. All living things were created at the same. 1 Organisms Change Over Time. 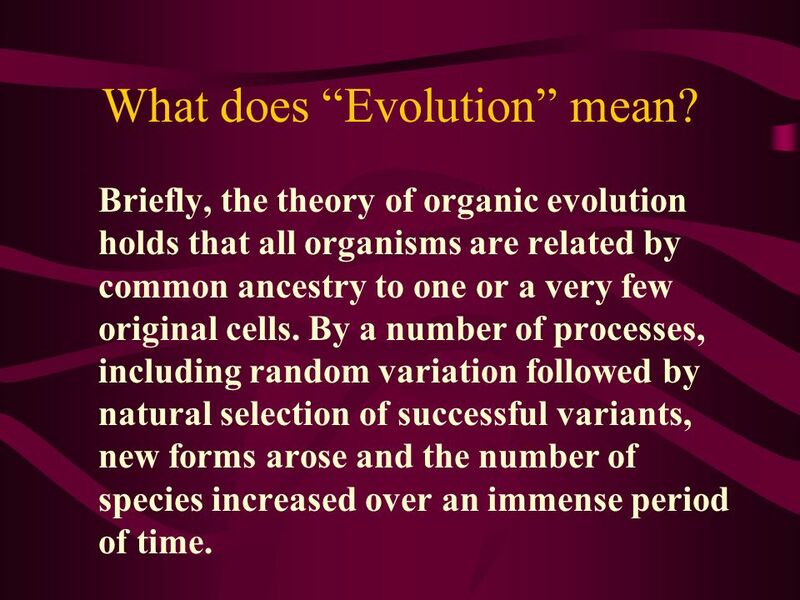  Darwin proposed that organisms descended from common ancestors  Idea that organisms change with time, diverging from. KEY CONCEPT A population shares a common gene pool. EVOLUTION SBI3U/3C M. St Denis. Charles Darwin – 1809-1882  An English Biologist  Fascinated by different species and fossils.  Traveled around the.